Hallelujah for CREATION STORIES, especially the ones that we CREATE for ourselves! 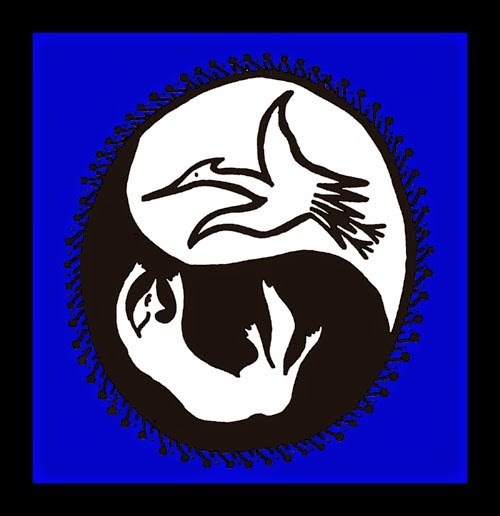 Today in response to the prompt on THE DAILY CREATIVE PRACTICE, my group on Facebook (join us here), I would like to tell the story of how I became Earth Dog White Bird long before I became Hallelujah Truth (see prompt below). In the beginning was me, Ruth Schowalter, a journalist and poet, who one day decided to take her words and fashion them into images. I was 30 years old, and three decades of living seemed to weigh heavy on me. Nontraditional, unmarried, curious, well-educated, but directionless, I peered into meditation and my dreams for answers. I had returned to meeting with a mentor, Dr. James Yhu, to continue understanding the principles of Buddhism. We had met when I was 25 and rooming with Wu Mei Qin, a PhD candidate majoring in Noise Control Engineering and one of the first young mainland Chinese scholars allowed to pursue her studies in the United States. We lived in Auburn, Alabama. How far away that time seems now! Chinese culture and language engulfed me throughout my 20s--the time I spent in Auburn, Alabama, and I studied as much as I could of both but never got to travel to China. However, I did choose to claim my Chinese horoscope with an open heart. Based on the year and month I was born in, I was the EARTH DOG! Then because my life was rich with Chinese friends, teachers, and students (who I tutored English), I gained another identity! My name RUTH poses a pronunciation challenge for many language speakers, and Chinese speakers pronounce the "r" as an "l" and the "th" as an "s." RUTH then became pronounced as "loose." Since I was tall and white, the bird, my Chinese tutor, Michele, associated me with was the white heron. Surprisingly, the Chinese word for this white bird is pronounced "Loo Se." 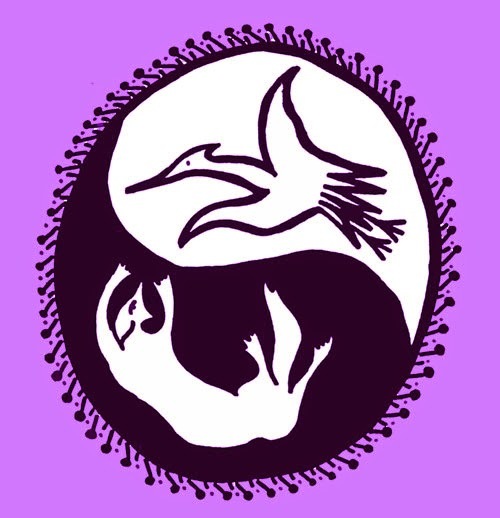 Delighted that I identified with two animals that fit quite well into the Yinyang symbol, I decided to create a logo to represent ME! Grounded in the EARTH and flying in the SKY, seeds of one another, perpetually shifting flowing and becoming. And that is how I became EARTH DOG WHITE BIRD when I was 30 years old, long before I named myself Hallelujah Truth. Create anything. Then in writing, describe the process, in any fashion, how you conceived, manipulated, and/or were influenced. Think of this as your CREATION STORY. You are invited to let your response be reflective and historic—giving us a sense of something that already happened. Your CREATION STORY helps everyone in the group to become aware of the context in which your creative work is made. That's Coffee with Hallelujah! SOUL BLOG with me and share your CREATION STORY with me. I also invite you to join my Facebook group, The Daily Creative Practice, and share your story with others there. Big Love to you all. I love this, Ruth. You identified important aspects of yourself, and embodied Earth Dog White Bird which I see today in you as very grounded, and your eloquent words for others help their spirits soar. I'm a Wood Rooster - which I continue to pay attention to because it feels as if that is a part of this life's grounding: earthy dirty pleasures (the nature of which continues to flux and flow) and waking with the birds is a daily thrill, still. Thanks so much for modeling this weeks prompt. Lee thank you for visiting my blog and leaving such a supportive comment! I love knowing that you are a Wood Rooster! It suits you! I really experience your groundedness. I look forward to reading your response to the prompt. Well Dang it Ruth. Here I was thinking I was supposed to create something, then explain was supposed to explain the mechanics of how it was made and why I made it. This would have been excruciating for all involved as explaining why I create what I do frequently involves a long-winded diatribe on what I just read, saw, heard or ate. Thankfully, your response to the blog prompt has helped clarify the prompt. I found your blog a wonderful insight into your evolutionary history. It leaves me curious as to how much of Earth Dog and White Bird are still in you. I want to know how you transitioned into Hallelujah Truth and who was Ruth before she transmogrified. Thank you again for this lovely insight into you. Dear Special Needs Cat! I'm smiling at all the earnestness you display in your desire to respond to the Monday Funday blog prompts accurately. As a frequent writer of prompts (more than 20 years of teaching writing, I tend to be irreverent with writing prompts, seeing them more as fog rising from a hot summer pavement after a downpour. Since I have already seen your response to the prompt, I love how the "assignment" is evolving and look forward to reading what others write. Will they follow our suit or respond entirely differently? I hope we stay in touch and if we do, I know you will learn more about my evolution. Thanks for caring.